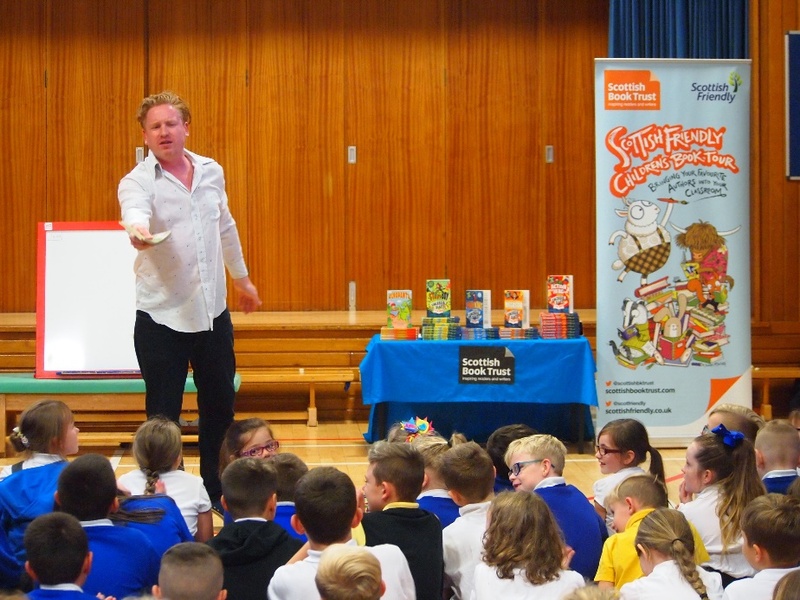 In mid-September, the Scottish Friendly Children’s Book Tour took the hilarious children’s author and screen-writer Ciaran Murtagh to meet and make laugh pupils from 12 schools from across Renfrewshire, East Ayrshire and Falkirk. Ciaran has written over 30 books and regularly writes for well-known children’s programmes including the Amazing World of Gumball, Diddy TV, Mr Bean and Shaun the Sheep. Before moving into writing, he has previously worked as an actor and comedian. His latest book series Fincredible features the mischievous character Fin Spencer, who finds himself in possession of a magical diary which he uses to get into (and out of) all sorts of scrapes. 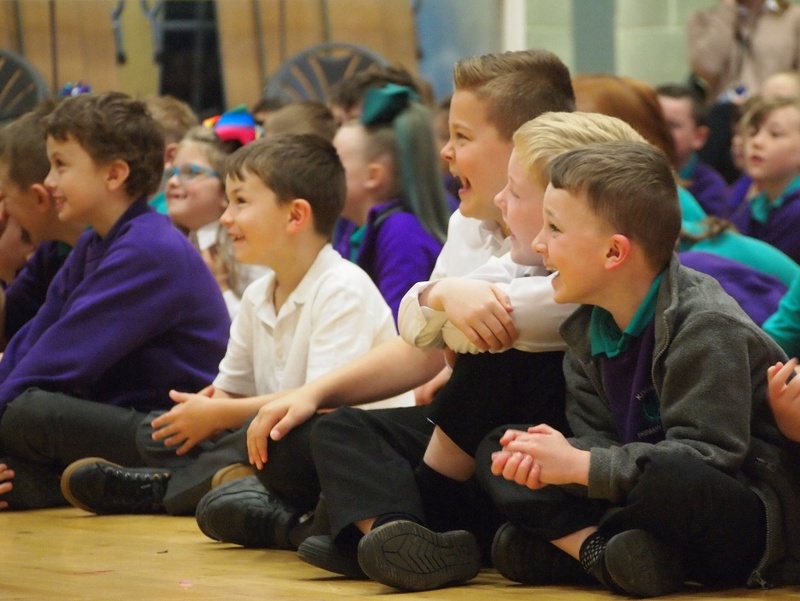 The sessions took place with P4-7 pupils in school halls in Paisley, Renfrew, Kilmarnock, Cumnock and Falkirk. The aim for the session was for pupils to be enthused about reading and writing, and especially reading for pleasure. 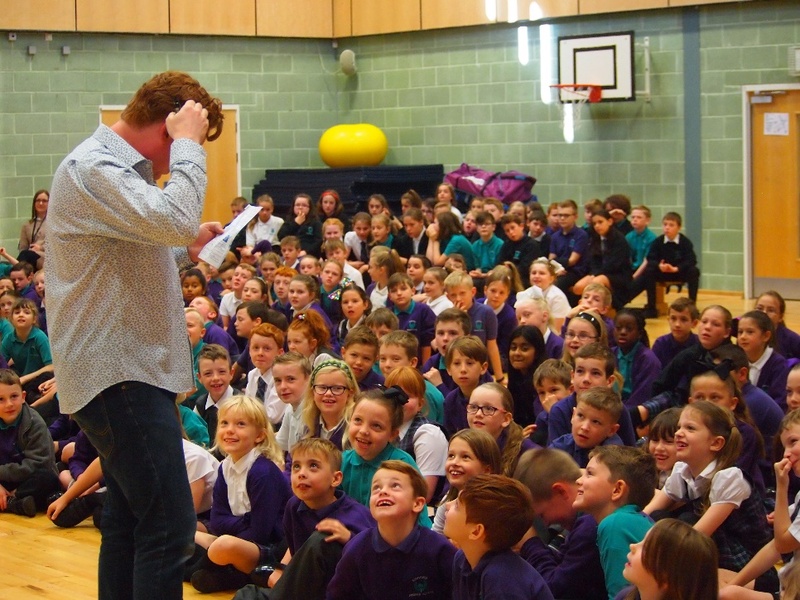 Ciaran certainly entertained the pupils with his anecdotes and short stories, and through a lot of laughter and enjoyment, engaged pupils in creative writing. Ciaran’s sessions were wonderfully interactive and started with Ciaran discussing his screen-writing career, encouraging pupils to think about different forms of writing. However, by far the most enjoyable part of the session was the story building workshop. First, each group needed to create a title for their story and this was found by choosing words from a dictionary page. Each group created five titles, then voted on their favourite. I was rooting for Professor Plum in one session, but alas it was outvoted. Next, the group chose a genre for how to tell their story. Everything from Romance, to Adventure, to Sci-Fi to Drama was suggested. Unsurprisingly, “funny” was the top genre choice in most schools! From this, Ciaran improvised a story on the spot. Top titles created included The Musical Mustard, the Squirrel on the Stallion and Spread the Spinach. Ciaran would come back to the group midway through the story for a plot idea, and many a story took an interesting, unexpected turn. By the end of the session, the group had a sheet filled with titles, genres and plot ideas to take away with them and use for future creative writing. All the P4-7’s who took part in the session left enthused and inspired by Ciaran’s visit. We would like to say a huge Thank You to all the schools who took part and to Ciaran for such an engaging, entertaining and inspiring event! The children (and staff) haven’t stopped talking about it! Thanks for making my boring little Tuesday 100% BETTER than what it was going to be. Ciaran was amazing! He was so energetic and shouty (in a good way). He is such an inspiration! Ciaran is so enthusiastic and funny. His coming to our school was amazing. He gave such great advice on how to become an author.